You are here: Home / Money / Business / Pass on the plantation, buck. Pass on the plantation, buck. But what do we really know about American chattel slavery, other then the same, simplistic, regurgitated information from our middle school history books? Another foe to the visit is economics. And there is where I can agree. Visiting plantations boosts the personal economy of the owners of the land (and/or business). At the same time though, our consistent presence requires tour guides to check their narrative. 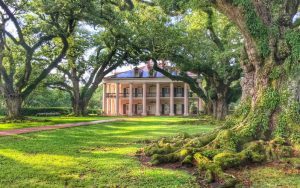 Many plantations tours focus on the land, the beauty of the home itself, the family who occupied it, but do little real, in-depth discussion on the enslaved who built and created wealth for predominantly white families. I first visited Oak Alley in 2011 during an outdoor festival on the grounds. It was my first time being out deep in the country, and my first time truly being on the grounds of a southern plantation. I spent a lot of time wandering by myself, thinking, praying, vibing with the landscape. On this visit, I felt. I could feel the hurt, the agony, the resistance, the evolution of the African family, the warriors and queens. Being on that land, without fully understanding all of its extensive history, I could still feel and understand the collective soul of the oppressed, the desire to outlast suffering, the necessity to survive not just for self but for future. The survival and selflessness spoke loud and clear. Another reason black folks need to show up to plantations is to show our interest in our own story, no matter how difficult they may be. Too often here in the states people attempt to sweep painful past experiences under the rug, especially slavery. Around the country there have been numerous stories of early education school books completely omitting slavery from its pages, or justifying this embarrassing American history by calling enslaved Africans something other than enslaved peoples (I.e farmers, servants, workers). Visit a plantation or any culturally black experience and see how many non-blacks show up and show interest. A LOT. Ownership! I think a movement should spawn in conjunction with reparations. Yes, reparations are long overdue and needed to close the still thick gap between marginalized folks and wealthy, resource-laden folks and communities. One segment of that give-back should be land: plantations. In 2016, home ownership for blacks reached its lowest point since the late 1960’s when discriminatory housing practices were supposedly ratified. Land and home ownership in, on, and around plantations is a must, as it can allow for generational housing to be realized, as well as family history to be shared and passed down. The income families made from enslaved people’s work has been passed down to thousands and thousands of whites families. It’s time for the tide to change. This talented young man can also be found over at; The California Creole and also Charles Patreon Page.